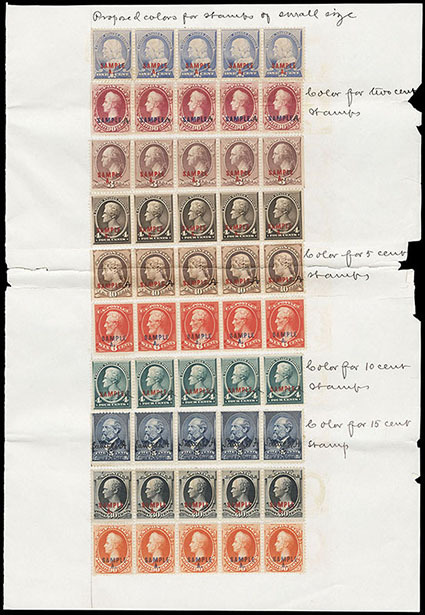 1890 Issue American Bank Note Co. Proposal For Adhesive Postage Stamps, folio size document dated Sept. 23, 1889 bound together with string and submitted to the Third Assistant General, enclosed are two pages headed "Proposed colors for stamps of small size" with rows of 5 overprinted "Sample" stamps including on page one: 208S-L, 212S-L, 214S-L, 211S-L, 191S-M, 209S-M, 211S-M, 216S-N, 190S-L, 191S-L; and other page with 212S-K//191S-K, some stamps with manuscript notes in margin like 191S-M "Color for two cent stamps"; splitting along horizontal fold affects one row of stamps on each, including second bound page severed, fresh and Very Fine. A REMARKABLE 1890 ISSUE DOCUMENT SHOWING THE USE OF THE SAMPLE SPECIMENS. 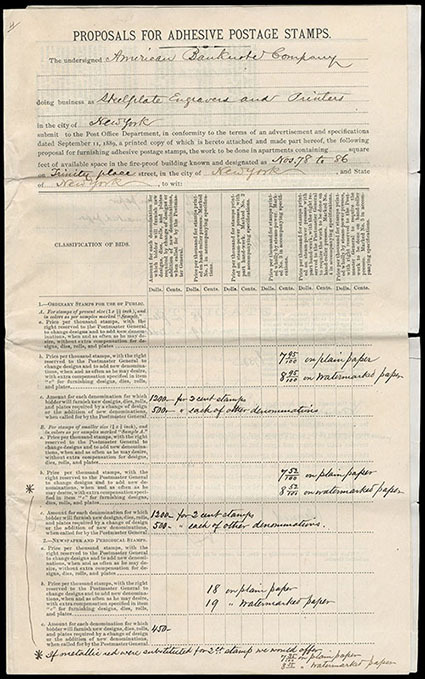 The request for proposal by the Post Office Department for the contract of 1890 in two sizes, current large size and a smaller size about 75% of the current issue. If the contract is awarded by the Postmaster General in the smaller size, then the contracter was required to prepare and furnish the necessary new designs, dies, rolls with the necessary cost included in the bid. 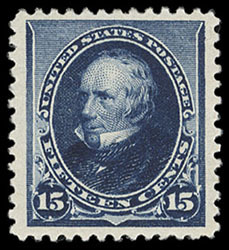 Ultimately, the Post Office choose the American Bank Note Company sealed bid for smaller designs that were typical of the current British stamps in circulation. 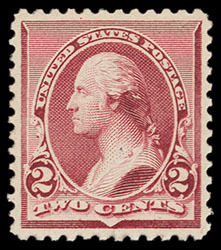 1890, 2¢ pale lake, o.g., never hinged, precise centering and well balanced margins, strong vivid color, Extremely Fine and choice; with 1998 P.S.E. certificate. 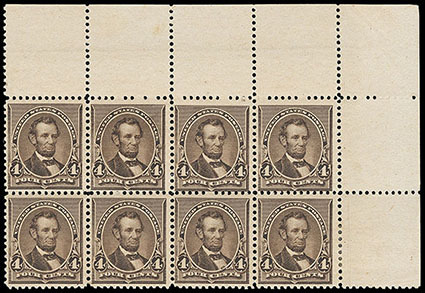 1890, 4¢ dark brown, corner margin block of 8, o.g., bottom right stamp h.r., others never hinged, rich color, Fine. 1890, 15¢ indigo, o.g., lightly hinged, uncommonly wide margins, deep intense color, an Extremely Fine jumbo; with 2012 P.S.E. certificate (Graded XF 90J, SMQ $625) . 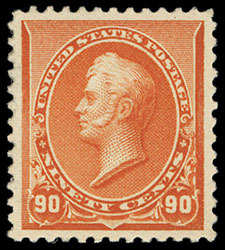 1890, 90¢ orange, o.g., lightly hinged, near perfect centering amid wide margins, rich radiant color, Extremely Fine to Superb, with only six examples grading higher; with 1996 P.F. & 2003 P.S.E. certificates, latter Graded (XF-Sup 95, $1,750).